Joker is amazing, and Lloyd too would be an absolute treat. I'll fight anyone who complains about "too many anime swordsmen", I'll fight them with annoying disjoints and possibly demon fang projectiles. Well, Jokers reveal lead me to have even more hope in Lloyd (and 2B). Let's hope they keep the announcements on this high level. Yes I definetly think Jokers addition really does make me think Lloyd's chances are at maximum! Cant wait for the next reveal! One thing that puzzles me, When joker was announced it said "Challenger pack 1" is that meaning more is to come after the 5? I believe they mean that each character is a "pack" - as in they each come with music, character, and a stage. Ahh, good way of looking at it. If Vergeben's right (once again), and we do obtain a Square Enix rep, if we count Lloyd, that will make 3 characters from J-RPG for the Fighter Pass. Isn't a bit too much ? If anything this makes Lloyd or Yuri way more likely. Cool characters, series has Nintendo ties, surprising while still being fan favorites. I'm Lloyd all the way and there is nothing I don't love about the idea of Persona vs. Tales Of in Smash. I know it's almost impossible now to expect Lloyd to be revealed within this month, but then again… Joker reveal was a teaser, it didn't need gameplay, so they can reveal characters whenever they freaking want to push the sales for the Season pass, which matters most than waiting for each character individual release date… therefore, i'm gonna still cross my fingers to see what is revealed during the Tales of Anniversary. Tomorrow we are gonna have (or rather today at some hour, i can't remember) the tales of broadcast featuring lloyd's VA, i'm guessing it's gonna be in japanese but hopefully there is a tales of community out there that will translate anything juicy from it. - In an article in 2016, Sakurai was asked why he chose Lloyd over other Tales reps, and Sakurai's response, "I'm not sure if there was any other appropriate choice?" Why not the protagonist of the first game, Cress, he was asked. "I really think it has to be Lloyd here (laughs)." That and Heihachi is a sprite in Pac-Man's Namco Roulette taunt along with the Katamari character. Plus Japanese VA cultures treat a VA that died like the character also died as well. Since Bamco developed the game, they deserve a proper, own character. I mean, Pac-Man pretty much stands for his own as a icon. Like, you don't immediately think of Bamco when you see him. I previously stated this in another thread and mention it again: If Joker is any evidence to go with, we should believe Nintendo's word when they said DLC's gonna be surprises. For me, that means that those characters aren't present in Smash at all yet. So Lloyd's mysterious absence may really be an indicator. Also, it seems like they're really going for Japanese characters, like they did back then with Ryu, Cloud and Bayo and now with Joker. That's pretty good for us, too. I don't know why Namco doesn't have another character yet. If this pack of DLC is really going to be all third-parties, I can't see why Lloyd would be excluded. Pretty appalled but happy too how things keep going on Lloyd's favor as they come over time. On that end, highly curious how things in the anniversary stream will be going there indeed. ToS Chronicles or a full remaster would be dope. Apparently Tales of Crestoria is getting an english version of the game. I'm still browsing to see if anything else has happened during that broadcast… The actual anniversary is happening next week tho so there could be a chance for an announcement then as well, altho i don't know if smash is possible, but at least a new game could be announced or something. Honestly I'm surprised it hasn't happened yet considering it's been ported to everywhere else. I'll be buying it day one if so. A Symphonia port to the switch would be amazing, day one buy if it happens. Also, I agree with you all saying Bamco is due for another rep, and with Heihachi seemingly out of the picture, the only other candidate is a tales rep (preferably Lloyd). Well I know the VA also voice's FE's Xander. Is he one of the shop keepers in the game? Yeah, like Doc Louis and Funky Kong. If in my playthrough I see xander I’ll make a note of it but as of now I’m not too sure. Can we expect anything from the anniversary though? I thought they celebrated early this year with the announcement of Tales of Crestoria mobile? Do you have a link for the stream? I’m willing to be potentially blown away. I just posted this in the Smash Ultimate General Discussion thread and I figured ya'll would appreciate it. "But tehponycorn," you say, "this has already been done!" You would be correct, as Not-Neuro on Reddit (who I believe is our own VashTehStampede ) wrote a long post detailed potential points supporting Lloyd's inclusion. However, I'll be diving deeper into the argument of why Lloyd should be included more than "here's how cool of an inclusion he'd be." I'll acknowledge my own fan bias up front, as I highly regard Tales of the Abyss and enjoyed both the Tales of the Abyss and Symphonia anime series. That being said, I'll be leaving my bias at the door and, like my other two speculation posts, arguing more about "why I believe he's likely" instead of "why I want him." Spoiler: Background - Why a Namco Character? Since I am creating the new Smash Bros. in cooperation with Bandai-Namco Games, it makes sense to include one of their characters, and Pac-Man is perhaps Namco’s most iconic character, so Pac-Man should join the fray. Interviewer: Between Bandai and Namco, were there any other strong candidates for inclusion as a fighter? Sakurai: There were none. We basically thought of all the characters at the start of development. We decided on characters we knew we could make. However, there were a few in consideration, such as Heihachi from “Tekken. So, does the Tales of series fit these criteria? The Tales franchise debuted in 1995 on the Super Nintendo, and has been between Nintendo and Playstation systems with a singular prominent appearance on the Xbox 360. Prominent gaming journalist Jeremy Parish called the Tales franchise "quite arguably Japan's third-biggest RPG series, right after Final Fantasy and Dragon Quest," which where the claim of it being one of the "Big Three" JRPG series originates from, and certainly the sheer size of the series speaks for itself. The series has spawned multiple spin-off games, CD dramas, anime and manga series, and even has its own fan conventions in both America and Japan. The conference in Japan is so big that it's called a "festival. It's two days long and attracts tens of thousands of fans (there were 22,000 in attendance in 2014). Did I mention that this festival has been held yearly for 11 years now? In my opinion it's more fitting to call the Tales of series a multimedia franchise instead of a simple video game series, but I digress. The series meets both of the two primary criteria for inclusion as it is both historic and iconic, even having a prominent relationship with Nintendo to boot, unlike Tekken or other Namco series. Faithful representation is incredibly easy given that the series plays like a conventional fighting game, and special attacks are attributed to directional inputs, similar to the well known neutral, side, up, and down specials, which is another pro for the series. All that being said, we return to the main question: "Why Lloyd Irving?" At a surface level, Lloyd doesn't seem likely as a Tales of representative at all. Tales of Symphonia isn't as relevant as more recent Tales of titles such as Zestiria or Berseria, nor is Lloyd the most popular character within the series, as he's lucky to place within the bottom half of the Top 10 in official fan polls (his most recent results are 11th in the 8th character poll in 2017 and 9th in the 7th character poll in 2014). Two characters, Yuri Lowell and Leon Magnus, are legitimately banned from the poll because they were too popular and kept winning. Yuri Lowell, the most popular Tales of character and the protagonist of Tales of Vesperia, also just so happens to have a remastered edition of his game coming out in less than a month from the time of writing, making him a natural pick for inclusion as the Tales of representative, right? You see, the thing about Lloyd Irving is that he is THE Nintendo Tales of character, and Tales of Symphonia's impact on the series is large enough to make up for a lack of relevancy and popularity. Tales of Symphonia is interesting because Nintendo stepped in to personally advertise it themselves alongside Bandai Namco. It was a prominent Nintendo Gamecube release, and stands as an outlier in a series predominantly on Playstation systems at the time. The game itself was popular enough to warrant a sequel which was another prominent Nintendo title, making the Tales of Symphonia games the closest related to Nintendo in the series. Another huge component was that we had a lot of support from Nintendo, so that allowed us to reach out to a broader audience that we weren't able to reach before. In 2014, Tales of Symphonia was further called the most successful title in the series for the 6th generation of consoles by product manager Dennis Lee, beating out Tales of Rebirth, Tales of Legendia, and Tales of the Abyss for that position. Both of these interviews occurred after the releases of Tales of Vesperia and Tales of Destiny, where the two most popular characters in the series originate from. Tales of Symphonia is significant because it did what Dragon Quest still has yet to do: break into the Western market. Prior to its release, the Tales of was largely unknown in the West, but Symphonia changed that. While the series is still largely based in Japan, Symphonia introduced the series to the Western market with a splash, thanks to Nintendo. From there, it's managed to establish a community prominent enough that Bandai Namco takes feedback from them for the series. Lloyd is perfect mix between the series' Western and Eastern popularity and has the most prominent association with Nintendo out of any character in the series, and that is what makes him the most likely pick. "but tehponycorn," you say, "Sakurai chose Cloud instead of Bartz or Terra because he was more popular despite having no association with Nintendo!" But on the other hand, if you think about who to add from Final Fantasy, it’s hard to come up with a choice that’s not Cloud. We could have used Terra or Bartz, protagonists in their own right, but I feel like there would be some people who wouldn’t know who those characters are. Everyone knows who Cloud is compared to other Final Fantasy protagonists. Lloyd doesn't have this problem compared to Yuri Lowell or Leon Magnus, and i is more well known in the West than the former two due to Symphonia's success, and is well known enough in Japan to make up for a lack of popularity; he is arguably the most "globally recognized" character in the series given Symphonia's worldwide popularity. —The Tales series has 20 years of history, how did you decide on Lloyd for the costume? Sakurai: I’m not sure if there was any other appropriate choice? Sakurai: I really think it has to be Lloyd here (laughs). I could have gone down the route of choosing from the first entry in the series, but for old games it’s somewhat common for the editorial supervision from the original creator to make the process difficult. While Sakurai, vague as always, doesn't elaborate on why Lloyd was the only "appropriate choice," the two characters mentioned, Lloyd and Cress, are the two characters in the Tales of series with the most prominent ties to Nintendo. Regardless, Lloyd is apparently the only choice for a Tales of representative, and that is incredibly significant. It's very well that the answer to the question: "Why Lloyd Irving?" could simply be "Because Sakurai said so." I'm omitting the argument that Mii Costumes are concessions to fans of popular characters given the speculative nature of it (we will never truly know how well a character performed in the Ballot, but I will acknowledge the possibility that Lloyd's Mii Costume was added due to a successful turnout within the Smash Ballot. Characters such as Inklings, King K. Rool, and Chrom all made the jump from Mii Costume to playable in Ultimate, and it's a reasonable conclusion to believe that Lloyd could make the same jump. If we choose to believe the statements of insiders such such as Vergeben and BKupa666 's source this conclusion becomes more solid as the Ballot was taken into heavy consideration when deciding to include Simon and King K. Rool respectively. Tekken is a 3D fighting game, further than that, another essential aspect of the game is its controls: different buttons control different limbs instead of having different buttons for light, regular, and heavy attacks like other fighting games. 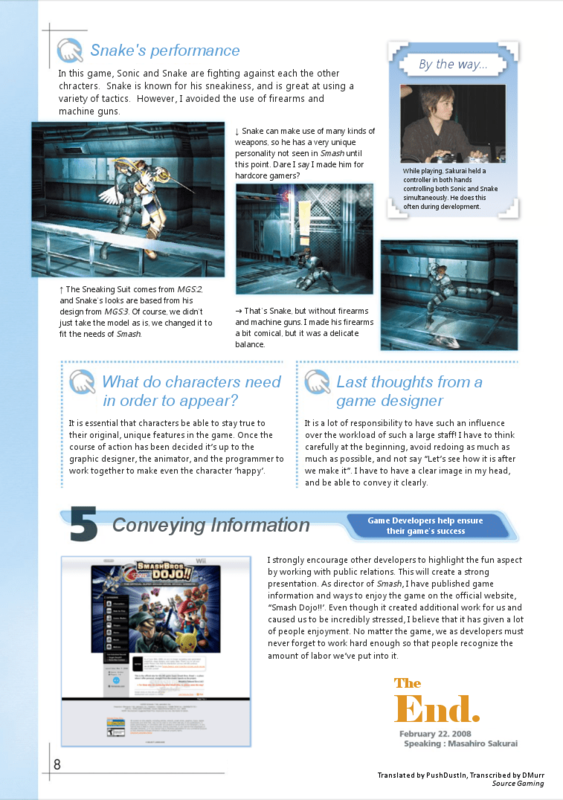 These factors among make it difficult to faithfully represent Tekken within Smash Bros, and therefore it isn't worth butchering the series core mechanics to incorporate it into Smash Bros. Faithful representation is an essential aspect of a character's inclusion in Smash Bros., and if Sakurai and co. can't be true to Tekken's gameplay, they simply won't include him. Sakurai has revisited scrapped ideas before, such as the Miis, Villager, Pac-Man, and Ridley, all of whom he believed couldn't be faithfully represented within Smash Bros., but this isn't a matter of being a non-fighter or being too big; the dissonance between Tekken's gameplay and that of Smash Bros. is too large to viably come up with a compromise and still faithfully represent the series. Heihachi will likely remain an aspect of Pac-Man's Namco Roulette taunt, and will get a Mii Costume at best. Lloyd Irving is, at the very least, the most likely character for inclusion from Bandai Namco. No other franchise of their's bar Tekken comes anywhere close to the impact and legacy of the Tales of series, and Tekken is far too difficult to viably include in Smash so it's a nonstarter. I will admit that KOS-MOS and maybe Agumon could be dark horse picks, but neither have the popularity or relevancy to match the Tales of franchise, especially in regards to Smash Brothers, where the only two well-requested characters from Namco are Lloyd and Heihachi. Hopefully through writing this you can understand just why I see Lloyd as being so likely, and why I would more be surprised if he isn't one of our DLC fighters instead of if he is. Wow this post took way too long to write. I started writing this almost immediately after finishing my last one on Monday (if you haven't read it yet, it's a lovely little essay about why we shouldn't be so quick to trust insiders using The Game Awards as an example), but I got sidetracked and experienced writers block up until now. To add insult to injury, my computer auto-updated Thursday night, deleting any progress I had (I foolishly hadn't saved anything) and forcing me to rewrite the entire essay. Fortunately, nothing of major substance was lost, but it was a large inconvenience. I have an idea for one more speculation post, but I don't know if I'll actually get around to writing it. At worst I'll write a mini speculation post about it as I don't know if I have as many sources as I'd like for it and need to actually search for sources instead of having them on file from previous speculation like my last two posts (and parts of this one). If there are any topics you'd be interested in me discussing more in-depth I'd love to hear any suggestions or feedback in general you have for me. Believe it or not, I enjoy writing large essay-length arguments like this, and I find them particularly interesting to research and (relatively) easy to write, and if a topic interests me I'm more than willing to go in-depth in researching it and then report on what I find. Again, feel free to suggest topics and we'll see what happens from there. Anyways, I hope you enjoyed reading this! Lloyd is being rated in the Rate Their Chances thread, come show your support. Just be sure to leave enough reasoning for your scores! So Blocked Content posted a new video about a rumor about the 3 other DLC characters(Sylux, Banjo, and Lloyd). Granted this should be taken with scepticism, but the boards are stale right now and we're probably going to have wait until January for Joker gameplay and a possible 2nd DLC reveal. The Lloyd (Mother) spirit isn't hidden in the game files. You can unlock it in the game.